The beta 2.75 version of HDSDR was released about two months ago. Now the stable version has just been released. HDSDR is a free general purpose SDR receiver, similar in nature to other programs like SDR# and SDR-Console. HDSDR can be downloaded from hdsdr.de. – displaying the RF (ADC) level in dBFS allow working with deactivated Tuner AGC – NOT oversteering/clipping the ADC. long periods of positive or negative levels will not fade towards zero. 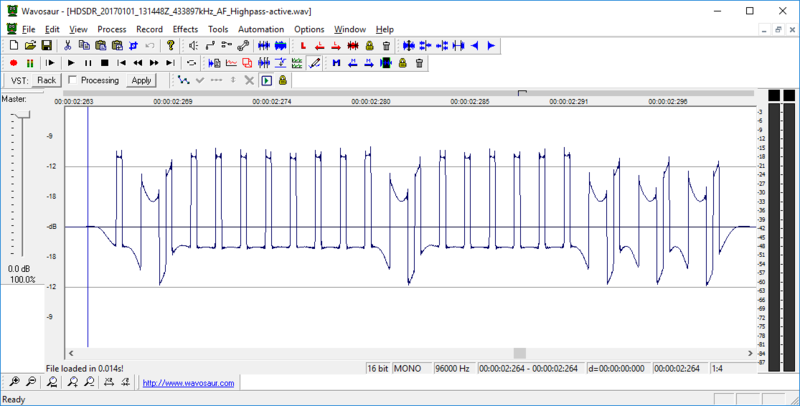 Find attached recordings and screenshots with active and deactivated highpass filter of a garage door opener demodulated in AM. – additive noise generator (Ctrl-N) is for hiding some alias carriers in scenarios where the ADC does not see real noise from the antenna. The noise generators level has to be configured carefully for not hiding real signals. A level between -25 to -10 looked fine for me. But that should be measured in a lab. Below are the mentioned attached images and .wav files. What about a module for TETRA to HDSDR? To start with I would like to say that I like the program HDSDR and I use it on a V3 dongle . I do have a question about the extended ExtIO capabilities . I am using the 2.75 stable version and I don’t see any extended ExtIO . The only ExtIO I see is the one that has always been their . Is the extended ExtIO something that is down loaded form website , if so what site is it ???????? Extended capabilities are API functions, which can be used from NEW ExtIOs. One of that is the 8 bit capability, for which the RTLSDR ExtIO was already prepared for. Everything else has to be programmed. Have not downloaded the latest version, but must say that HDSDR which I use with an SDR dongle and Up-converter is an excellent software. I especially like the large “S” meter on the dashboard.